The new restaurant, in the space that once was home to Emeril Lagasse’s Table 10, will change its menu every week. The fire of Peru is coming to Las Vegas. Ricardo Zarate, the L.A. chef behind white-hot Rosaliné in West Hollywood, is opening Once (pronounced on-seh) in the Grand Canal Shoppes at The Palazzo. 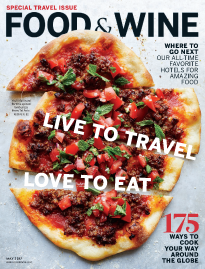 On one level, you could say that Once, a gigantic, 10,000-plus-square-foot restaurant scheduled to debut in March, is the culmination of a storied career that also includes being named a 2011 Food & Wine Best New Chef. But Zarate sees Once, which is taking over a space previously occupied by Emeril Lagasse’s Table 10, as the beginning of something much bigger than one colossal restaurant: Once is the incubator for Nikkei, a Peruvian-Japanese concept that Zarate eventually wants to open around the world. Cooking in Vegas, with a 160-seat restaurant that has a lot of space to add additional tables as things progress, gives Zarate a chance to experiment with many new dishes and create bigger, bolder versions of his greatest hits. 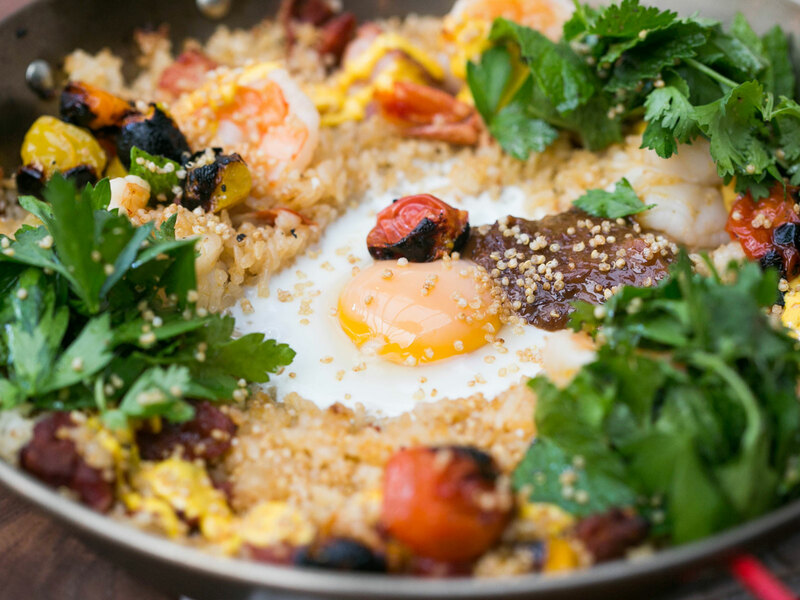 At Rosaliné, Zarate is known for serving chaufa (Peruvian fried rice) in the style of paella. That dish is made with Japanese rice, pancetta, Chinese sausage and shrimp. At Once, Zarate wants to raise the stakes by making chaufa with snow crab. He’s been playing around with seafood sudado, a stew served on a large tray. “It’s going to come with a crispy whole fish and a bunch of seafood: sea urchin, mussels, clams, all the seafood you can imagine,” Zarate says. The name Once refers to the fact that Zarate, who grew up in Peru and started cooking before he was a teenager, was the eleventh out of 13 children in his family. So he’s planning for his new restaurant to have a core of 11 dishes, along with some specials and some small bites when he’s feeling frisky. He’s working with suppliers in California and plans to change the menu every week. 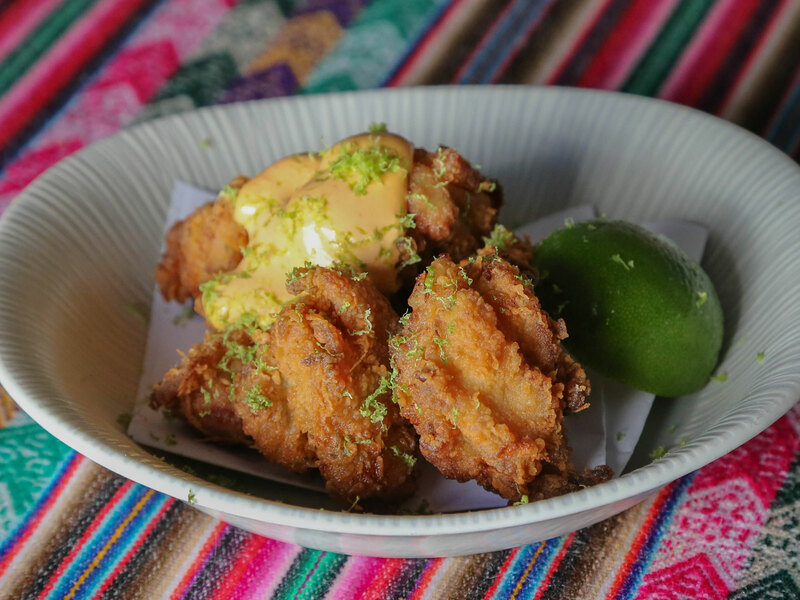 He’ll be serving tiraditos, ceviches and his versions of classic Peruvian meat dishes, like lomo saltado. 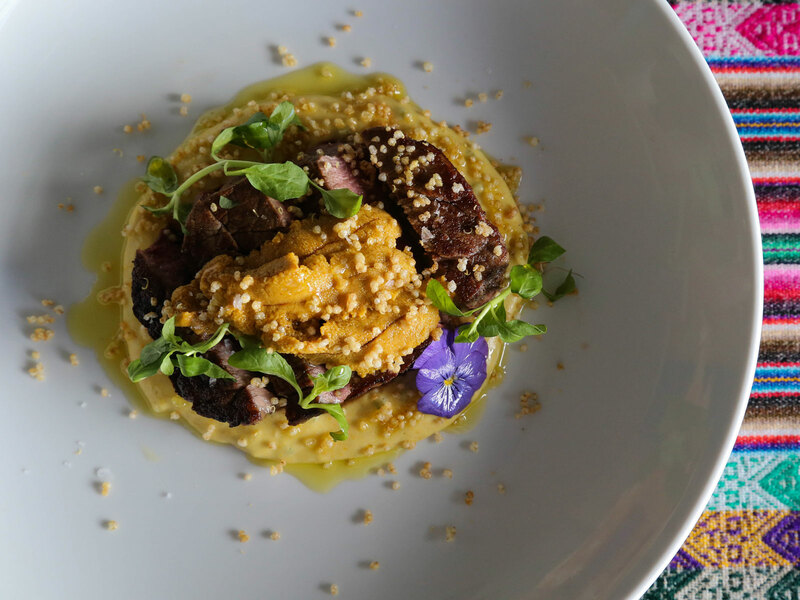 Zarate’s the first Peruvian chef with his own restaurant on the Vegas Strip, so he’s ready to have some fun as he introduces both tourists and locals to another cuisine. “It’s like I’m coming and putting the Peruvian flag in there,” Zarate says. Zarate has been on a wild ride. He originally started Once as an L.A. pop-up in 2015. He had previously established himself as the king of Peruvian food in L.A., but the pressures of the industry paired with some personal issues (both his mother and brother died) made him depart his restaurant empire in 2014. Mo-Chica, Paiche and Picca have all since closed. Zarate, at a career crossroads, launched his Once pop-up at Santino’s in Santa Monica. The kitchen setup wasn’t ideal, so he cooked chaufa paella outside, on a makeshift grill he built behind the restaurant. “Once was the incubator for Rosaliné,” says Zarate, who also released a cookbook, The Fire of Peru, in 2015. Once is a lot different now. Zarate has so much kitchen space in Vegas that he’s figuring out how to “compact” things and just cook with what he needs. He figures he might not even use half of his kitchen at first. He knows he’ll enjoy working with the restaurant’s “really incredible” gas grill, which guests will be able to see. 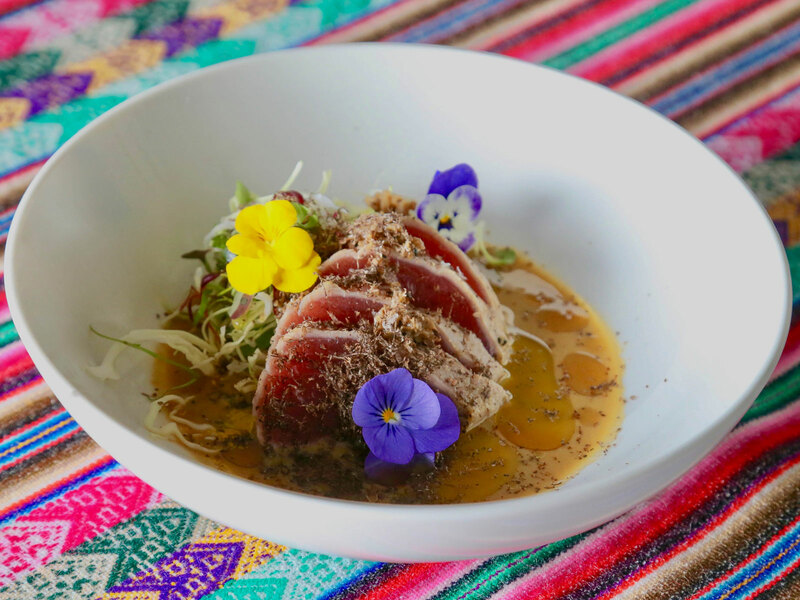 Zarate will blend Peruvian and Japanese flavors in dishes like a tuna tiradito with black truffles. Tiradito is typically raw seafood, sliced like sashimi and served with a spicy and citrus-heavy sauce. Zarate’s tuna tiradito might be lightly seared. He’s also thinking about serving raw scallops with some kind of wasabi sauce. He might use hot stone plates for meat-and-rice dishes that sort of resemble bibimbap. He’s also been messing around with fried chicken and uni-topped steak. He’s planning a version of tacu tacu (rice and beans) that could have oxtail, egg and banana. He’s working on gnocchi, maybe sweet potato gnocchi, with aji amarillo and wasabi. He says he’s dealt with every dietary restriction imaginable in West Hollywood, so he’s ready to be flexible and offer guests a wide variety of options. The foundation for Once has been forming for a while. Zarate remembers how a Japanese friend in Peru needed some wasabi and sent him to Lima’s famous Surquillo market. Zarate was 11 at the time. This was his introduction to wasabi. He and his friend used it to make an octopus tiradito. Zarate later moved to London, where he spent more than a decade working in Japanese restaurants. (He started as a dishwasher at Benihana.) Then at 19, he got a job at Aykoku Kaku, where he learned how to cook classic Japanese dishes under the intense tutelage of 60-year-old Japanese chefs who had left Japan three decades ago to work at the restaurant. Zarate would later cook at Zuma in London. Zarate’s friend Roy Choi, a 2010 Food & Wine Best New Chef, recently announced a restaurant at Park MGM. Both chefs rose to fame with modest ventures in L.A.. Zarate started Mo-Chica as a stand inside Mercado La Paloma. Choi launched the Kogi food truck. Now both chefs are simultaneously working on glitzy casino restaurants, and you can bet on a lot of bold, game-changing flavors hitting the Strip in 2018.